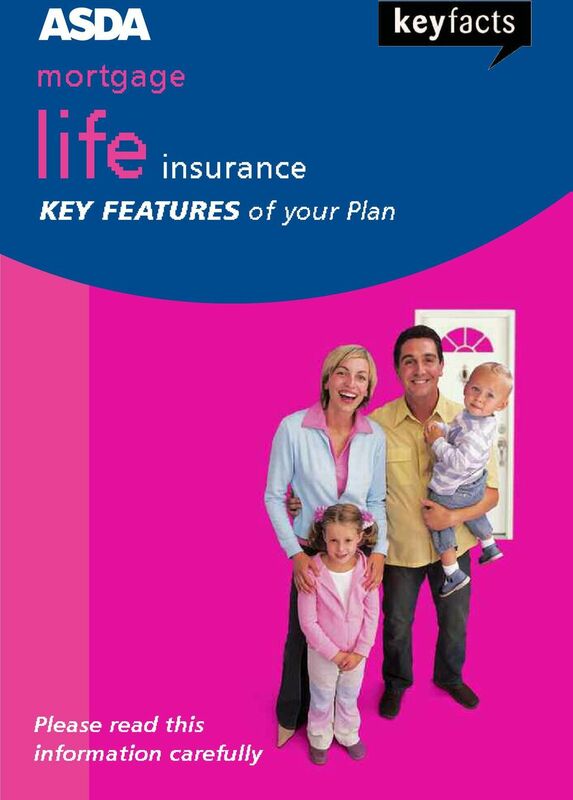 Download "life insurance KEY FEATURES of your Plan"
2 ASDA Life Insurance plans are provided by Scottish Widows plc. These Key Features give you the main points about the Scottish Widows Mortgage and Business Cover Plan. They include a quotation showing how much cover you may have and the cost. 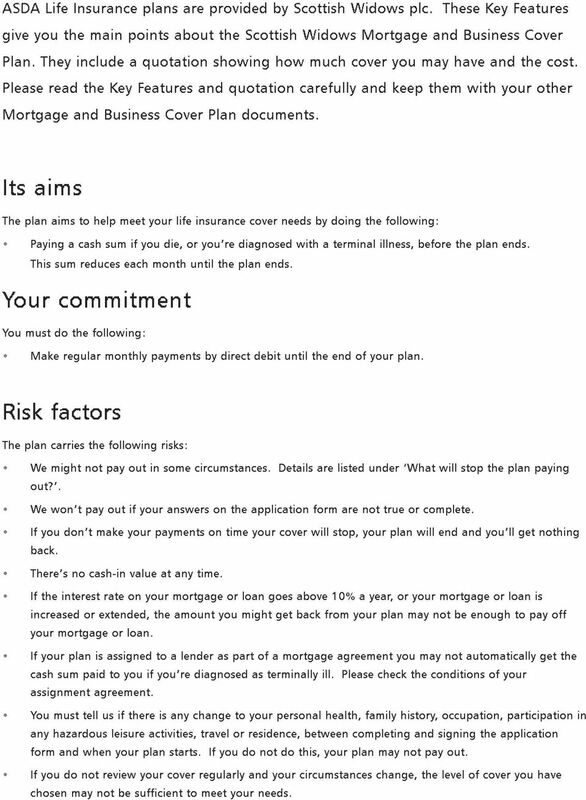 Please read the Key Features and quotation carefully and keep them with your other Mortgage and Business Cover Plan documents. 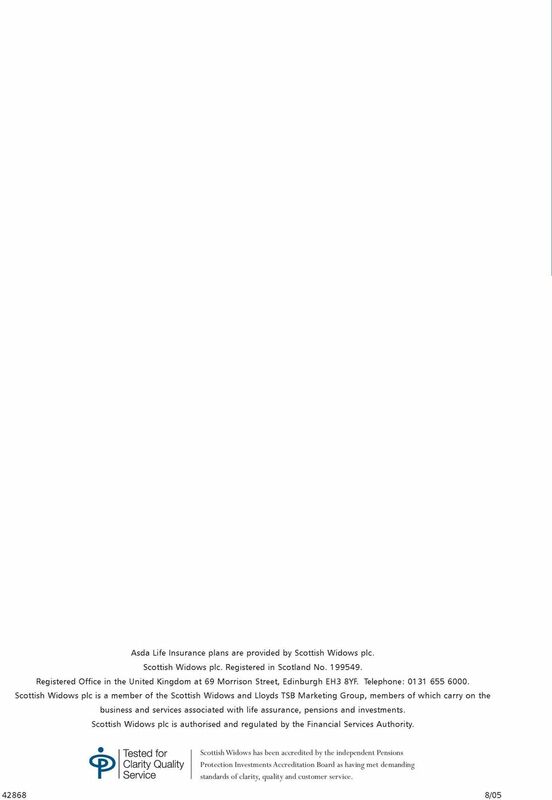 Its aims The plan aims to help meet your life insurance cover needs by doing the following: Paying a cash sum if you die, or you re diagnosed with a terminal illness, before the plan ends. This sum reduces each month until the plan ends. Your commitment You must do the following: Make regular monthly payments by direct debit until the end of your plan. Risk factors The plan carries the following risks: We might not pay out in some circumstances. 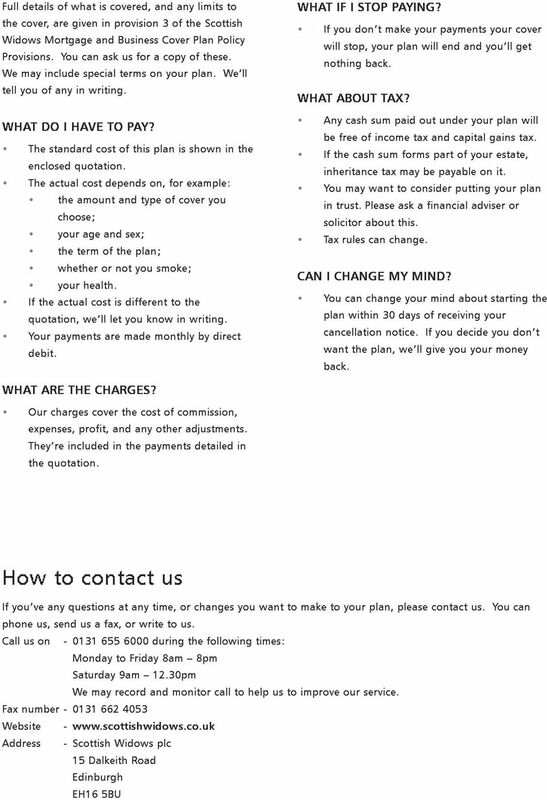 Details are listed under What will stop the plan paying out?. We won t pay out if your answers on the application form are not true or complete. If you don t make your payments on time your cover will stop, your plan will end and you ll get nothing back. There s no cash-in value at any time. If the interest rate on your mortgage or loan goes above 10% a year, or your mortgage or loan is increased or extended, the amount you might get back from your plan may not be enough to pay off your mortgage or loan. If your plan is assigned to a lender as part of a mortgage agreement you may not automatically get the cash sum paid to you if you re diagnosed as terminally ill. Please check the conditions of your assignment agreement. You must tell us if there is any change to your personal health, family history, occupation, participation in any hazardous leisure activities, travel or residence, between completing and signing the application form and when your plan starts. If you do not do this, your plan may not pay out. If you do not review your cover regularly and your circumstances change, the level of cover you have chosen may not be sufficient to meet your needs. 3 Questions and answers WHAT IS A SCOTTISH WIDOWS MORTGAGE AND BUSINESS COVER PLAN? It s an insurance plan that can pay out a cash sum. You choose whether the plan covers your life only, or the lives of you and another person. If the cash sum has not been paid out by the end of the plan, the plan will end and you ll get nothing back. The plan will end if we pay out a cash sum. You choose the level of life insurance cover at the start of the plan. This is normally the same amount as your mortgage or loan. We ve assumed that the cash sum will be equal to the amount that is outstanding under a standard repayment mortgage, with a fixed rate of interest at 10% a year. The following table shows the youngest and oldest ages when you can start a plan and the shortest plan time available. Life Assurance Cover Youngest age when you start plan 15 Oldest age when you start plan 65 Oldest age when plan will end 70 Shortest time for which you can set up your plan 5 years If the plan is taken out on the lives of two people, then please use the older person s age to work out the oldest age when the plan can start. HOW FLEXIBLE IS IT? You may be able to increase the amount of life insurance regardless of your state of health at the time, if you: increase your mortgage or take out a new mortgage (if your plan is already linked to a mortgage); get married; have a child; legally adopt a child. Full details and any restrictions are given in provision 7 of the Scottish Widows Mortgage and Business Cover Plan Policy Provisions. You can ask us for a copy of these. WHEN DOES THE PLAN PAY OUT? You can choose to cover your life only. This means we ll pay out the cash sum if: you die, or; you re diagnosed as having a terminal illness. You can choose to cover two people on a first death basis. This means that we ll pay out the cash sum on the first person: to die, or; who s diagnosed as having a terminal illness. 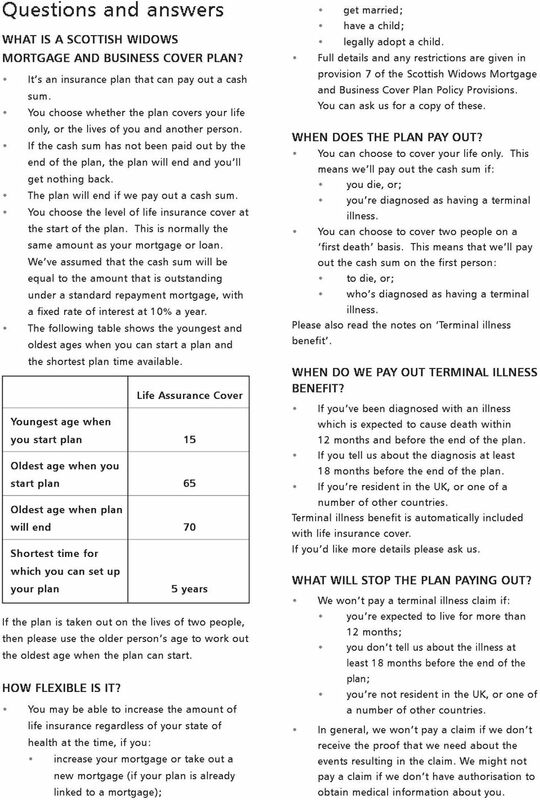 Please also read the notes on Terminal illness benefit. WHEN DO WE PAY OUT TERMINAL ILLNESS BENEFIT? If you ve been diagnosed with an illness which is expected to cause death within 12 months and before the end of the plan. If you tell us about the diagnosis at least 18 months before the end of the plan. If you re resident in the UK, or one of a number of other countries. Terminal illness benefit is automatically included with life insurance cover. If you d like more details please ask us. WHAT WILL STOP THE PLAN PAYING OUT? We won t pay a terminal illness claim if: you re expected to live for more than 12 months; you don t tell us about the illness at least 18 months before the end of the plan; you re not resident in the UK, or one of a number of other countries. In general, we won t pay a claim if we don t receive the proof that we need about the events resulting in the claim. We might not pay a claim if we don t have authorisation to obtain medical information about you. 5 Other information HOW TO COMPLAIN If you ever need to complain, first contact us using the details shown earlier. If you re not satisfied with our response, you can complain to: The Financial Ombudsman Service South Quay Plaza 183 Marsh Wall London E14 9SR Tel: Website: Complaining to the Ombudsman won t affect your legal rights. HOW TO CLAIM You can notify us of a claim in writing or by contacting us on At this stage we will write to you to explain what you should send us. It is very important that you keep your policy schedule and Policy Provisions in a safe place once you receive them, as these contain important information about what is covered under your plan. In the event that you or your dependants need to make a claim on your plan, we will ask for the policy schedule. Your policy schedule will detail the benefits which you selected when you set up your plan. 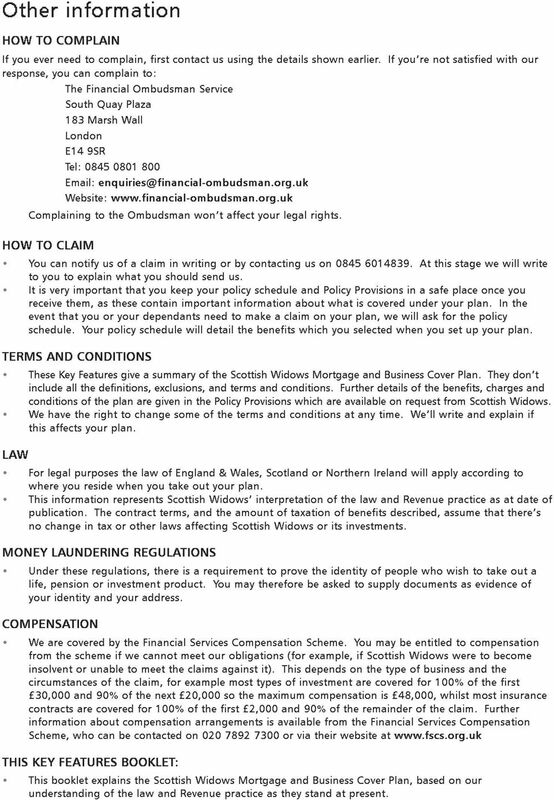 TERMS AND CONDITIONS These Key Features give a summary of the Scottish Widows Mortgage and Business Cover Plan. They don t include all the definitions, exclusions, and terms and conditions. Further details of the benefits, charges and conditions of the plan are given in the Policy Provisions which are available on request from Scottish Widows. We have the right to change some of the terms and conditions at any time. We ll write and explain if this affects your plan. LAW For legal purposes the law of England & Wales, Scotland or Northern Ireland will apply according to where you reside when you take out your plan. This information represents Scottish Widows interpretation of the law and Revenue practice as at date of publication. The contract terms, and the amount of taxation of benefits described, assume that there s no change in tax or other laws affecting Scottish Widows or its investments. MONEY LAUNDERING REGULATIONS Under these regulations, there is a requirement to prove the identity of people who wish to take out a life, pension or investment product. You may therefore be asked to supply documents as evidence of your identity and your address. COMPENSATION We are covered by the Financial Services Compensation Scheme. You may be entitled to compensation from the scheme if we cannot meet our obligations (for example, if Scottish Widows were to become insolvent or unable to meet the claims against it). This depends on the type of business and the circumstances of the claim, for example most types of investment are covered for 100% of the first 30,000 and 90% of the next 20,000 so the maximum compensation is 48,000, whilst most insurance contracts are covered for 100% of the first 2,000 and 90% of the remainder of the claim. Further information about compensation arrangements is available from the Financial Services Compensation Scheme, who can be contacted on or via their website at THIS KEY FEATURES BOOKLET: This booklet explains the Scottish Widows Mortgage and Business Cover Plan, based on our understanding of the law and Revenue practice as they stand at present.